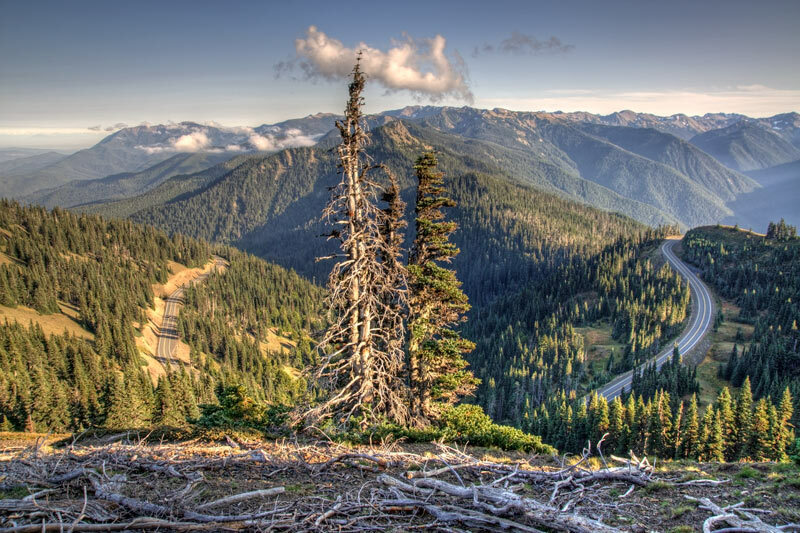 3-shot HDR from Hurricane Ridge, Olympic National Park. The weather over the past few days has been absolutely phenomenal, so I set out on Saturday to Olympic National Park. I had originally planned to drive down to Oregon for the Historic Columbia River Highway, but I realized I hadn’t visited the much closer Hurricane Ridge, yet. No longer used to catching ferries since many, many years ago on Prince Edward Island, we ended up missing our target sailing, so had to wait about 40 minutes in the lineup for the next one. The trip from Edmonds to Kingston was aboard the MV Walla Walla, which brought back a ton of memories from before the Confederation Bridge was built, connecting PEI to the mainland – we stood out on the bow of the ship the entire time, where it was frightfully chilly at times. Our first stop was Port Angeles, for a quick lunch, then we set off for the mountains. From sea level, we climbed (or rather, the car climbed) about 5500 feet over a span of 17 miles. It was a mainly clear day, although some moisture trapped in the mountain valleys created a few low-altitude clouds. All along the road, wherever we saw a turn-off, we prepared ourselves for awe-inspiring vistas. Although there was some haze, we could first see down to Port Angeles, then the open water, and eventually, when we got high enough, Vancouver Island. Mount Baker loomed far in the background, wreathed in clouds. The drive was a ton of fun, with very twisty roads, climbing and wrapping around the mountain ridge, and when we burst out to the top of the ridge, we were greeted with what I think is best described as a miniature version of the Alps. There were 180 degrees of uninterrupted mountains to the south, and 100 yards across the ridge, you could look north to Canada. Breathtaking.